What are LED IP Ratings? Example :With an IP65 rating, the LEDs can be used in an outside setting and are water-resistant but they are not waterproof and are not suitable to be submerged. An IP68 can be submerged in water. 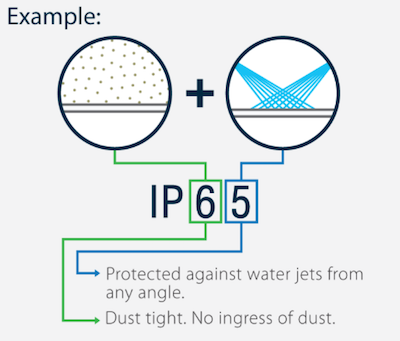 What is the difference between IP65, IP67 & IP68? The differences between commonly sold IP65, IP67, & IP68 strips are slight, but very important. Using the above chart as a guide, we can see that all strips are protected at the highest level from solids and dust. The variations come with the protection against liquids. IP67 = Water resistant plus. “Protected against the events of temporary submersion (10 minutes)”*Do NOT submerge IP67 LED lights for extended periods, these are not waterproof. What IP Rating Will You Need? If you don’t anticipate a harsh environment that is extremely dusty or wet then a lower IP rating would suffice. In places that will have a lot of dust, debris, or potential to be in contact with any solids or liquids, you’ll want to make sure that the IP ratings are high and that you have adequate water resistant or waterproof coatings on your LED strip lights. See our customer submitted gallery! Our ColorBright™ and UltraBright™ LED strip lights come in both IP65 outdoor protection and IP20 non water-resistant. If you have a project that requires IP68 waterproof LEDs you can contact our LED strip lighting experts at Flexfire LEDs and we can get your lights special ordered. We do not stock them normally. We can also help you with your lighting design projects. Call us at 1-844-FLEXFIRE (353-9347) or Contact Us here.